The formation conditions and the geomorphological dynamics of the dunes reveal that these are unstable structures. The proximity of the sea acts as a strongly selective factor in the installation and growth of its vegetation. Apparently simple, this medium is actually quite complex and precarious. It is not by chance that on the side facing the sea one sees such great floristic poverty, since the coastal plants are subject to strong winds loaded with salt particles, excessive luminosities, thermal amplitudes ranging from the scorching summer sun to winter biting cold. This causes considerable transpiration in the plant, which, coupled with the great permeability of the dune soil that allows rapid infiltration of the water that falls in it, irremediably condemns a hostile environment of xerophilism, that is to say, an environment in which the conditions of dryness This one must resist, to survive. And, in fact, the psamophyta plants, which live in the sands, survive because they have developed more or less profound adaptations that mainly prevent excessive losses of water. However, it is not only against desiccation that the plant struggles; it also has to face the burial, when the strong or constant winds, coming from the sea, push the sands of the beach inland. The first dune in front of us, called anteduna or advanced dune, relatively low and quite unstable, shows, in the part facing the sea and near the upper limit of the tides, an association of Cakile maritima and Salsola kali; already to the top, fennel Elymus farctus and sometimes the marsh-of-beaches Euphorbia paralias and E. peplis. The vegetation in this narrow strip is very spaced and the wind easily moves the sands, which drags inland. Notwithstanding the transposed short distance, the new place where they are deposited is more welcoming, it suffers less severely the effects of the wind and the felling arrives less salty. Conditions, if not favorable, are created, at least less unfavorable to the fixation of other plants, which, in turn, will, by different means, retain more sands. Along with the sandbank Elymus farctus now appears the other great dune builder and pioneer in its colonization: the Ammophila arenaria, commonly called reversal. 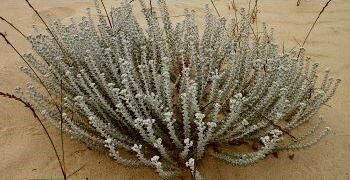 They are also accompanied by the beaches of Euphorbia, and you can see the little lambs of the Otanthus maritimus. Thus the dune grows, with richer and more varied floristic composition. At the top can be found the Calystegia soldanella or cauliflower, whose heavy seeds are easily buried, thus compensating factors adverse to the survival of the species, Lotus creticus, thistle or Eryngium maritimum, the Crucianella maritima, the sand-narcissus Pancratium maritimum, along with the reversal Ammophila arenaria, which, by the way, grows a little everywhere, in more or less dense stands, depending on the area in which it was established . In the interior face of this dune and in the interdunar that follow, in land already definitively fixed, next to some of the species already mentioned others join the list of psamófitas, namely, the perpetual-sands Helichrysum italicum, Pseudorlaya pumila, Thymus carnosus, Armeria pungens, Artemisia campestris ssp maritima, Anthemis maritima, Corynephorus canescens, Linaria polygalifolia ssp lamarckii and L. pedunculata, Reichardia gaditana or Silene niceensis, to mention only the most abundant or conspicuous. It should be noted that Thymus carnosus is a Portuguese endemism, and only observable in Alentejo and Algarve. 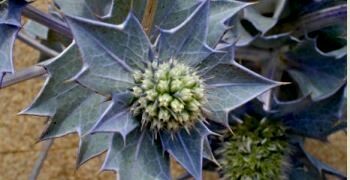 It is that small, dark-green tuft, of a bland size, which, more than any other dune plant, when crushed leaves an intense and pleasant scent somewhat resembling that of lavender. The interdunate fixed sands provide good conditions for the growth of prostrate plants, with a rather short root system, small leaflets, which spread in broad rounded spots. Examples are the silver-grass or Parsonchia argentea, Ononis variegata, Medicago littoralis, Polygonum maritimum or Hypecoum procumbens, another species occurring only in the Algarve. At the boundary for the understory are the large Anriallis monelli, a beautiful prostrate of intensely blue flowers, the Anarcum-de-campo or Avelino Linaria spartea, Scrophularia frutescens, Cleome violacea, Pigeon Heron or Corrigiola litoralis, the chorale of Dioscorides Aetheorhiza bulbosa and Pycnocomon rutifolium, is also confined to the Algarve and a few more places in Mediterranean Europe. The marshes originate in coastal areas of calm waters. The reduced flow of the tides facilitates the deposition of the debris and sediments in suspension and thus arise vasa banks where, at a certain point, there is substrate for the vegetation. 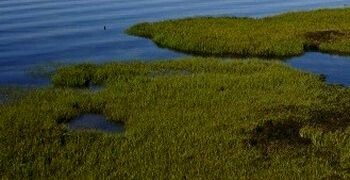 The pioneer colonization is a grass of the genus Spartina (in the Ria Formosa, S. maritima, which supports long periods of submersion and, therefore, is settled in the zones of lower quota, where it forms vast “meadows” of dark green color in the middle of the waters, and which constitute the low sapal or parchal. Once established, the vegetation dampens the force of the current and sedimentation accelerates; at the same time, removing moisture from the vasas through the root system, consolidates them. Where the substrate is less resistant to the erosive action of the waters, the typical canals and sprinklers that groove the marsh in a dendritic tangle are formed. The continuous accumulation of sediment increases considerably the level of the bottoms, with the consequent reduction of the time of submersion and the saline content. The final result is the gradual changes in the vegetation, in a sequence that will lead to the zoning observed in the marshes. Still in the lower marsh but in a slightly higher bottom, Spartina may appear accompanied by perennial Arthrocnemum, alone or in association with other Quenopodiaceae such as Salicornia nitens, Suaeda maritima and Halimione portulacoides, and a Plumbaginacea, Limonium algarvense, which constitutes an endemism of the Algarve. In the middle marsh, the previous species are gradually being replaced by Sarcocornia fruticosa and Arthrocnemum macrostachyum and, finally, Suaeda vera. It is evident that, depending on the locations, there is a certain variation in floristic composition. Large portions of the border of the high saphire are dominated by another Plumbaginacea, but in this exotic case, Limoniastrum monopetalum, which forms dense clumps in which the pink-lilac color of the flowers stands out, gathered together in abundant spike. 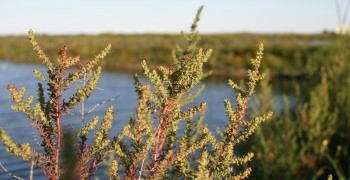 As the soil becomes firmer and more aerated, other Quenopodiaceae come together, namely Halimione portulacoides and, depending on the soil, clay or sandy, Atriplex halimus or Salsola vermiculata. At the outer boundary, Juncus spp. 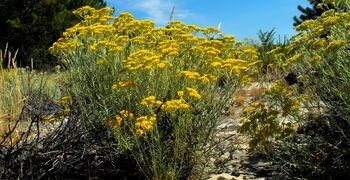 and the madorneira Artemisia campestris. Parasiting Woody kenopodiaceae, of the genus Atriplex, Suaeda or Salsola, Orobancácea Cistanche phelypaea, with their beautiful flowers of an intense yellow tone, arranged in spigot at the terminal part of a fleshy stem with a thick base that is washed, offers us the only colored spot in this set with so much mortiço of colors. 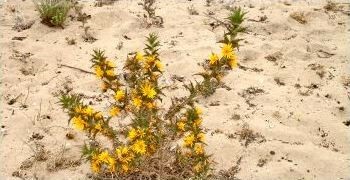 It is not a rare plant, however, it has a relatively localized distribution, as it appears only in southern Portugal, Spain and Crete.